Viner Caremark Pactimo take first and second place in the Shay Elliot Memorial last weekend. Renowned mental fitness guru Alan Heary heads out on the road this week in support of Ireland’s top cycling team Viner Caremark Pactimo in the annual Rás Tailteann 8-day stage race. The Viner Caremark Pactimo squad will face a peloton packed with top international cycle racing talent and, looking to continue their race winning success on the domestic racing scene, they now intend to pull out all the stops in the battle for supremacy throughout the week. Leaving no stone unturned in their quest for glory, the team have partnered with Alan Heary to tap into the mental toughness skills and techniques that have been utilised by world champions and world class professionals in a variety of sports from boxing to cycling over the years. 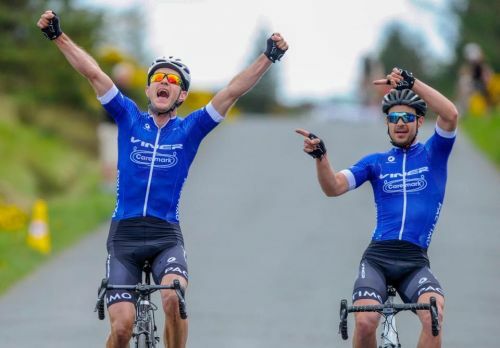 Heary has worked with Viner Caremark Pactimo since they were announced late last year and the mental fitness guru has watched with pride as his charges have raced to a series of important victories already this year. Approaching the biggest event of the season, the Viner Caremark Pactimo team have two of the top three ranked racers in Ireland and four of the top eight. Conor Hennerbry’s victory in Rás Mumhan over the Easter weekend has helped propel him to the number one ranking in Ireland while Matteo Cigala, Ronan McLaughlin and Seán Lacey have all shown the jersey with pride through the early months of the season. McLaughlin led Cigala home for a dominant one-two finish in Ireland’s biggest one-day classic, the Shay Elliott Memorial in Wicklow last week and the team are looking forward to testing their form against international opposition when the Rás Tailteann begins in Drogheda on Sunday (20th May). The 1180km event includes tough challenges in the mountains in Kerry and Wicklow along its eight-day route which concludes in Skerries on Sunday 27th May. The Rás is a recognised proving ground for world champions and the top Irish riders will go toe to toe with many of the emerging professional stars of the future. “This is among the very toughest challenges in Irish sport and it will take the riders to the very limits of their capacity to endure. For the Viner Caremark Pactimo team, it’s an opportunity to test ourselves against the best and perhaps challenge for stage wins. To do that, every part of the package needs to be in perfect harmony. Being at peak performance is key and Alan adds that extra percent in the form of mental toughness to the other elements of physical fitness, rest, nutrition and bike preparation. Alan Heary, who has worked on the Rás and with Olympian and world championship bike riders through the years, knows that the limits of his riders’ endurance will be tested during the week. “These are highly successful, super motivated guys who come together as a powerful team working towards shared objectives. They bring me in because I can add value to their effort and I think it’s instructive that it’s usually the guys that really want to be successful who go the extra mile to tick the boxes necessary to produce wins. Alan Heary is recognised as one of Ireland’s top mental fitness and performance coaches. His individual sports clients include world record holders, professional athletes, world champions, Olympians, professional golfers and inter-county GAA teams.